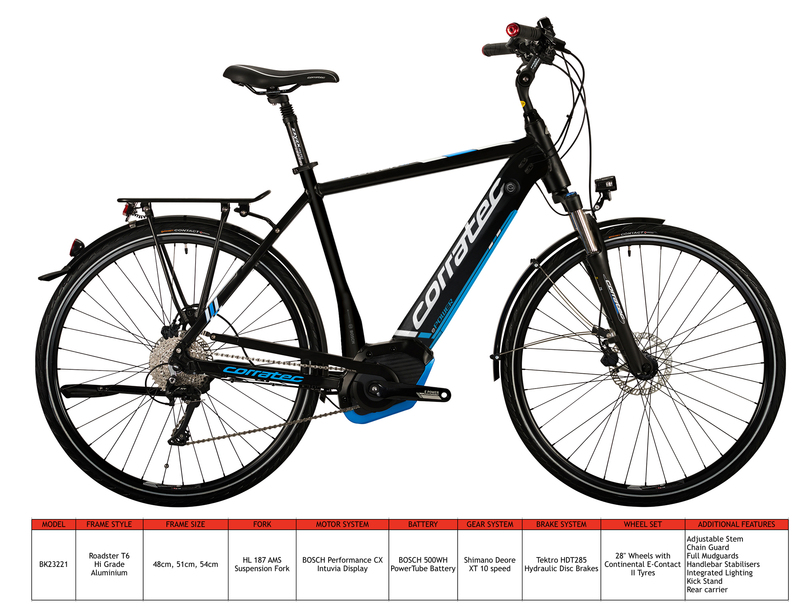 The perfect e-bike for long countryside treks the roadster style frame with 28” wheels gives a commanding riding position and incorporates our Shadow Edge Down Tube technology that stiffens the frame and delivers a more comfortable ride. Bosch Performance centre drive motor system with the new Bosch integrated powertube 500wh battery that not only maximises distances between charges it also allows Corratec`s designers to produce an aesthetically pleasing frame design . Shimano XT 10 speed wide range gears and Tektro hydraulic disc brakes are just some of the highlights of this premium Trekking e-bike. Traditional Roadster frame built in T6 triple butted grade aluminium matched to front suspension forks delivering a smooth and comfortable ride.